Clear, colorless, liquid photopolymer that will cure when exposed to ultraviolet light. Clear, colorless, high viscosity, liquid photopolymer that will cure when exposed to ultraviolet light. Optically clear, liquid adhesive that will cure when exposed to long wavelength ultraviolet light. Optically clear, liquid adhesive that will cure when exposed to either long wavelength ultraviolet light or visible light. 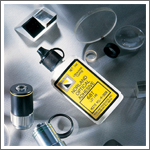 Optically clear, liquid adhesive that quickly cures when exposed to long wavelength ultraviolet light. Clear, colorless, liquid photopolymer that will cure when exposed to ultraviolet light and or visible light (blue-violet). Single component liquid adhesive that cures in seconds to a tough, hard polymer when exposed to ultraviolet light. Adhesive that will cure optically clear when exposed to long wavelength ultraviolet or visible light (blue-violet). Clear, colorless, liquid that will cure when exposed to ultraviolet light and or visible light (blue-violet). Clear liquid adhesive that will cure when exposed long wavelength ultraviolet light. 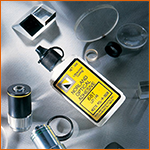 Screenable paste adhesive specifically designed to seal the perimeter of liquid crystal displays. Single component, UV curing adhesive used for temporary bonding of lenses to metal polishing mounts or where bonded components need to be easily separated in the future.